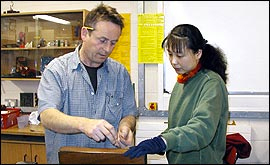 Paul Waldmann has been working in Cambridge as a furniture maker, restorer and teacher for the past thirty-five years. Inspired by the Bauhaus movement, Paul creates stylish and tasteful furniture, bespoke built for any household environment. Paul also teaches a variety of furniture classes in Cambridge and in London. For more details see our teaching section. For examples of Paul’s previous work please see our furniture making or furniture restoring sections. All the pieces showcased on this website were built to commission. Please email or call Paul if you are interested in having a unique item created. Paul is happy to build items to match the theme or specifications of your home environment.